It really is no exaggeration to say that London-based NWOBHM combo Angel Witch is one truly unique band. Having formed back in 1977 (under the moniker “Lucifer”) by guitarist/vocalist Kevin Heybourne, Angel Witch went through quite a decent number of line up changes prior to releasing their 1980 classic opus “Angel Witch” – an album whose power and influence was such that it granted the band legendary status but also an album which, according to many fans and media reps, has not been surpassed to date by Heybourne and his numerous collaborators. The band’s story becomes ever so comlplicated as the years go by and even though quite a few releases managed to see the light of day along the way, the last studio offering was back in 1986 – a nine track album entitled “Frontal Assault”. Twenty five years later (!) and featuring yet another new line up, Angel Witch are about to finally release their fourth full length album “As Above, So Below” and the one thing that I am sure most of you are wondering, as I certainly did, is whether this is still a band whose work is worthy of attention from fans and media alike. The short answer to that question is a confident “yes”, as Angel Witch have managed to bring to life eight classic-sounding compositions which, at the same time, come across as quite relevant, courtesy of a powerful crispy sound and of a, at times, more ‘unconventional’ approach to song-writing. I hope that the previous sentence did not put off any of the band’s older fans as you should still expect compositions with massive meaty riffs, especially now that Bill Steer (Firebird, ex-Carcass) is part of the picture, bringing, together with mainman Kevin Heybourne, a new lease of life to the Maiden-esque harmonic passages and twin guitar themes which characterise the band’s style and are present throughout the album. Will Palmer’s contribution on the album is of equal importance as there were quite a few occasions when his melodic bass lines, together with cleverly-crafted background keyboard themes, enhanced the epic atmosphere that this album so openly conveys. Good stuff, right? If you find yourself lacking a connection with “As Above, So Below” after the first couple of spins I urge you not to lose faith in it as this album is what you can describe as a ‘grower’ and it will not be long before you start to appreciate the beautiful guitar harmonies and flamoboyant solos of the opening track “Dead Sea Scrolls” or the Maiden-sounding riffs of “Into The Dark”. “Gebura” is a very unusual composition - straightforward riffs pave the way for Kevin Heybourne’s lead vocals which, as in the case of “Upon This Cord”, sounds slightly off key and somewhat off putting –until you start to realise that these discordant themes are actually quite catchy and memorable! Both “The Horla” and “Witching Hour” find Angel Witch sounding more urgent and epic than ever, with some trully massive riffs and atmospheric acoustic/harmonic guitar melodies, while the seven minute “Guillotine” is an old-school riff-orientated composition that will certainly appeal to the band’s older supporters. The best song of this impressive album is left to the very end and is entitled “Brainwashed”. This is a seven minute head-banging opus with riffs influenced by the likes of Mercyful Fate and awesome lead melodies/solos – a perfect way to end this quite impressive release. I had the pleasure of watching Angel Witch at last year’s Hellfest performing some of their classic material with the new line up and I remember being quite taken aback by how tight and harmonious they looked on stage. I get the same feeling when listening to these eight new compositions. 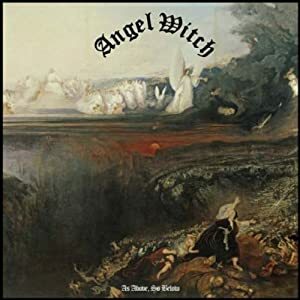 For a band that has not released a studio album for the past twenty five years, Angel Witch have done enormously well and the only reason why they did not get a higher rating than four starts is because the small gap between the ‘great’ and the ‘good’ compositions of the album is, at times, fairly detectable. Welcome back, Angel Witch – we hope that you will stay longer with us this time round!